it easier and more cost effective for salvage operators to realise the value of the parts on their vehicle stock. to market parts,” explains Jason Cross, managing director of FAB Recycling. “FAB Bundle is the destination for traceable, recycled vehicle parts, and lists a wide range of bundles stripped by professional, licensed dismantlers. Sellers charge a standard dismantling fee for each bundle in addition to the auction process which ensures they get paid for removing the parts as well as the market value for the components. The innovative approach taken by FAB involves the creation of parts ‘bundles’, which ensure commonality of descriptions and components. There are 12 bundles (see panel) and all sellers will upload images and descriptions to the site prior to a quality control check by FAB before going live. The bundles are then auctioned for seven days with registeredbuyers able to watch the bidding in real- time. His message to salvage and dismantling operators is clear: “Don’t let your cars gather dust, get the parts into the marketplace”. To ensure traceability, only approved partner, licensed vehicle dismantlers are allowed to sell bundles, and all listings are screened and approved by FAB Bundle staff before they go to auction. ATFs, salvage agents, bodyshops, vehicle dismantlers, reconditioners and suppliers will be able to bid on a wide variety of ‘bundles’ of parts at market prices. Trade buyers can register on the website and pay a small annual fee, plus a standard buyer’s premium on any bundles they buy in the auctions. In order to ensure quality control, FAB is providing clear guidelines on how parts are dismantled, stored and handled. 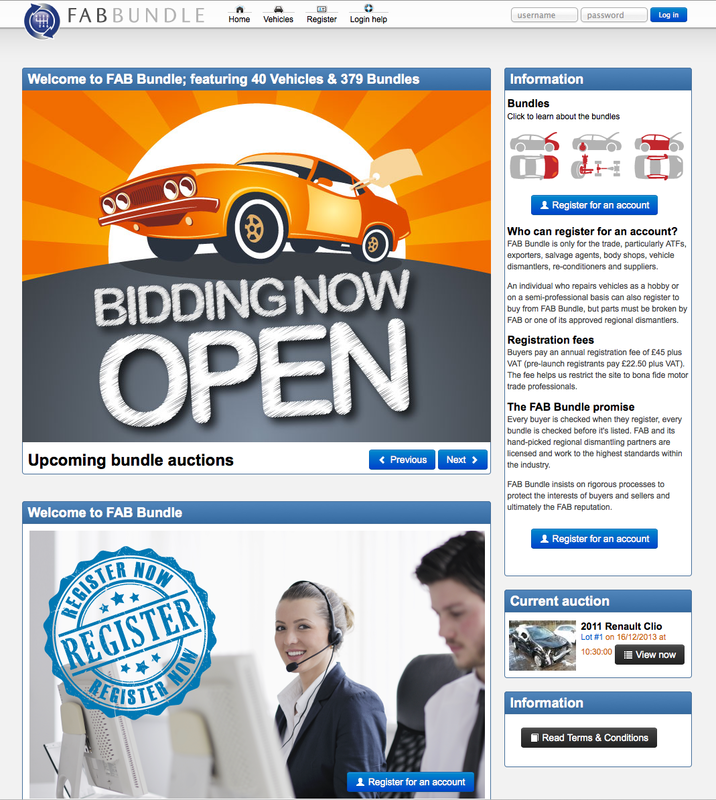 Buyers will be responsible for collection of parts, although FAB is providing a national delivery service for the part bundles it sells from its own stock. not be acceptable, given the industry’s experience of damage to body parts in transit. For the future, FAB is considering a standard delivery option with a set pricing menu. Midlothian-based SCB is already a partner selling bundles on the site and FAB is keen to invite BVSF members to get involved as sellers/partners.